You can use a secure repository to store keys, certificates, and sensitive data related to users and their password-protected applications. In addition, the repository provides cryptographic operations for generating new key pairs and verifying signatures. The central secure repository is protected by a password. The secure repository features are provided by a key manager. 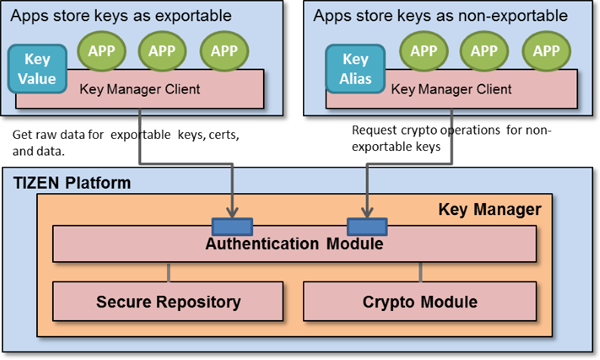 An application functions as a key manager client, and accesses the secure repository through the key manager. Only for data tagged as extractable, the secure repository returns the raw value of the data. If data is tagged as non-extractable, the secure repository does not return its raw value. In that case, the secure repository provides secure cryptographic operations for non-exportable keys without revealing the key values to the clients. All data in the secure repository is protected by a user password. If a client provides a password when storing data, the data is encrypted with the password. This password must be provided when getting the data from the secure repository. By default, only the data owner can access the data. If the owner grants access to other applications, those applications can read or delete the data from the secure depository. The format of an alias is "<package_id> <name>" and the name cannot contain any white space characters. If the client does not provide the package ID, the CreateFullAlias() method of the Tizen.Security.SecureRepository.Manager class adds the client package ID to the name internally. The client can only specify its own package ID in the alias when storing a key, certificate, or data. The client must specify the package ID of the owner in the alias to retrieve a key, certificate, or data shared by other applications. You can create 4 kinds of keys or key pairs with the Tizen.Security.SecureRepository.KeyManager class: RSA, ECDSA, DSA, and AES. The certificate manager verifies a certificate chain and returns it. The trusted root certificate of the chain must exist in the system certificate storage or be specified in the parameters. You can load a certificate from a file in the DER or PEM formats. The secure repository can also load a private key, certificate, or chain of CA certificates from a PKCS#12 file. Each client can adjust access control rules for their own data, certificates, and keys.